« 39. Passover/Abib 14 is a Festival Day! Before we address this issue in a future post, we would like to like to set the stage, so to speak, for the showdown or discussion of the facts especially as they relate to the more recent Modern-Hybrid System G that is practiced by the majority of the Sacred Name groups today. 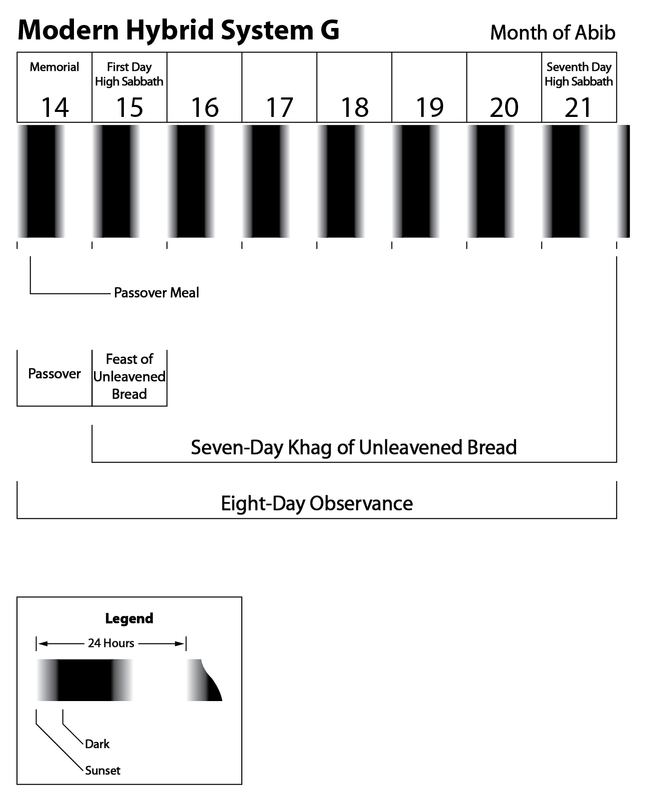 The Modern-Hybrid System G observance is the same as the Pharisaic/Hasidic System B in that they both constitute 8 days of eating unleavened bread from Abib 14 to Abib 21. They both have Passover Day, Abib 14, to be a non-sabbath and relegate it to just a preparation day. It is also not officially part of their 7-day Festival of Unleavened Bread which begins with Abib 15 and ends with Abib 21. Under System G and System B both Abib 15 and Abib 21 are High Sabbaths. The only difference between the two systems is that System G places the Passover meal at the beginning of Abib 14. System B places the Passover meal at the beginning of Abib 15. The Modern-Hybrid System G practice represents the majority of today’s Sacred Name groups. As one would expect, the adherents of System G and System B firmly assert that the authority for their particular practice is derived directly from Scriptures. As mentioned above, we will now direct our efforts to the popular Modern-Hybrid System G which is practiced by most Sacred Name groups of today. Interestingly, it seems that among most of today’s Sacred Name groups there is a prevalent lack of knowledge and/or understanding by the elders/teachers, either willingly or unwillingly, concerning the roots of their particular assembly’s stance on the Festival of Passover and Unleavened Bread. When one researches the matter, the facts indicate that there were two key players responsible for the popular Modern-Hybrid System G practice−Clarence O. Dodd and Herbert W. Armstrong. It is apparent that this Passover/Unleavened Bread practice as promoted by Dodd and Armstrong has been passed down to the majority of the Sacred Name groups of today who continue its use. It is important to recognize that Dodd and Armstrong both broke off from the Church of God, 7th Day in the late 1930’s and were in agreement that the keeping of the biblical Festival Days were required for all Christians. The major disagreement that Dodd and Armstrong would later have was the importance and use of the sacred name Yahweh which eventually led to the parting ways of their ministries. What is important to note is that they collaborated together and were in full agreement regarding the overall method for keeping the Festival Days. The only conflict they were to experience was a problem regarding the beginning of the biblical year as will be noted later in our discussion. The final outcome reached by Dodd and Armstrong was that Passover Day was Abib 14 and the Passover meal was to be eaten with unleavened bread at the beginning of Abib 14. Additionally, they determined that Abib 14 was not a High Sabbath but instead was a day of preparation for the High Sabbath day of the Festival of Unleavened Bread which began on Abib 15 and continued through Abib 21. It was also concluded that there was, in fact, a total of 8 days of eating unleavened bread to fulfill the instructions from Scriptures for the observance of Passover and the Festival of Unleavened Bread. When the facts are uncovered, one would be forced to agree that Clarence O. Dodd was one of the most influential persons responsible for promoting the use of the name Yahweh along with the observance of Festival Days among the early Sacred Name groups. It also has to be realized that the majority of today’s Sacred Name groups have their Festival-Day foundations directly tied to Dodd and Armstrong. In order to proceed onward toward the truth of the matter we must also recognize that there has been a willful suppression of the facts concerning the doctrines promoted by Dodd and Armstrong regarding the scriptural Festival Days. This suppression has been fostered by the many elders and teachers of the present day Sacred Name groups. Below are several excerpts from an article titled “How to Figure Passover” from the Good News Letter of 1940 by Herbert Armstrong. The purpose of this particular publication was to set the correct date for Passover that year. 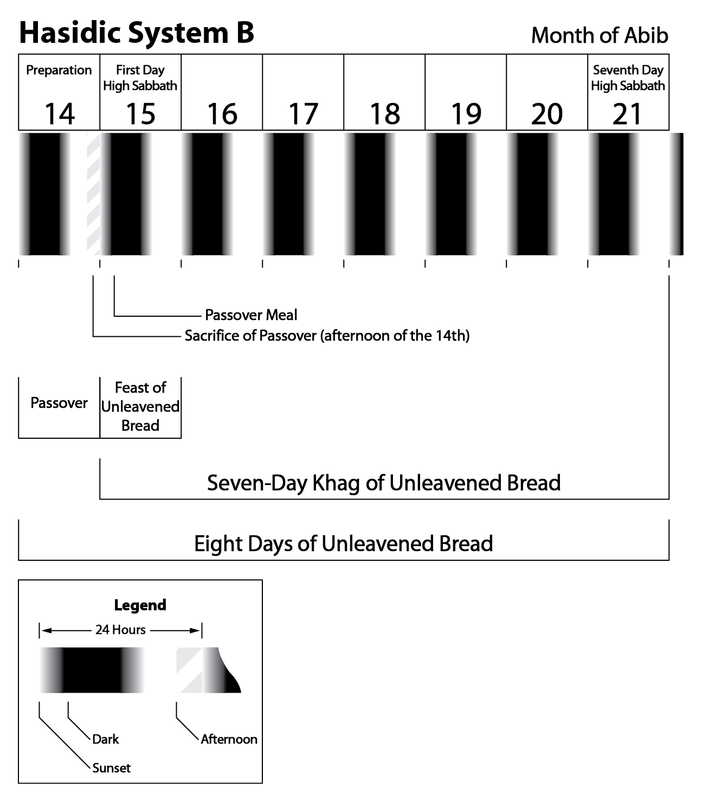 Even though Dodd and Armstrong were in full agreement regarding their distinct practice of Passover and Unleavened Bread (System G), Dodd had the beginning of the observance one month earlier than Armstrong that year. Yet we know God gave HIS PEOPLE a FIXED RULE for calculating TIME PERIODS, and for figuring WHEN to hold the Festivals of Jehovah. Then WHO HAS PRESERVED THIS TIME, this sacred CALENDAR? To whom did God give it? To whom were “the oracles of God COMMITTED?” To ISRAEL AND JUDAH, of course! . . . Israel LOST the Sabbath, LOST time, LOST even her national name and identity. But JUDAH NEVER DID. There is no other source thru whom God could have committed AND PRESERVED His calendar. He did COMMIT it to them (the Jews). Therefore it must be thru them He has preserved it! They (the Jews) had the calendar correct at the time of Christ. They figured Passover, all the feasts, as He did. In conclusion, unless God has preserved His sacred calendar thru the Jew, then WE DO NOT KNOW how to figure Passover or ANY of the holydays this year. For there is NO AUTHORITY for any other day. But, we ask (tho Brother Dodd is quoting from memory, and was unable to find the clipping or reference, or state WHERE he had read this), how did the man who wrote the article in the encyclopedia KNOW this was the ancient method of reckoning? Did He offer proof? The Jews, continuing the observance of all the seven annual festivals EVERY YEAR continuously, tho scattered all over the world, say it was figured anciently as they figure it today, by the Jewish calendar. What more dependable record has come down from Moses’ time? Bro. Dodd also cited Josephus, Jewish historian, to indicate that Passover could never be earlier than March 20th, or later than April 19th. God did not commit His oracles, or the preservation of His TIMES to profane history, or to the Roman Catholics, but to the Israelites. And they have been preserved BY THE JEWS. After thorough study of the Bible, of the Hebrew calendar, of history, and every angle,–after going into the matter with all the Eugene brethren, and other brethren who have made a special study of this question, we have unanimously agreed that the Hebrew calendar has been preserved correct by the JEWS. Even though Armstrong and Dodd disagreed regarding when the new year began, the evidence presented above demonstrates that the authority C. O. Dodd and Herbert W. Armstrong ultimately relied upon for the observance of the Festival of Passover and Unleavend Bread was the Pharasaic/Hasidic Jews! It is obvious that Dodd and Armstrong lacked due diligence when researching Scriptures. It is also apparent that they became confounded when trying to determine the correct method for the practice of the Festival of Passover and Unleavened Bread. When Dodd and Armstrong failed to find the answers from Scriptures it was blatantly admitted that it was the authority of the Jews that was used to determine the truth of the matter. Sadly, there has been a false assumption that Dodd and Armstrong did proper scriptural research when they promoted the Modern-Hybrid System G practice. This unwarranted assumption has led many elders and teachers of most present-day Sacred Name groups to blindly accept a false premise when consulting Scriptures regarding the Festival Days of Yahweh. In turn, many of the members of these various Sacred Name groups have also accepted the false premise as taught by their leaders. No matter how one tries to reinterpret Scriptures and force their predetermined outcome, the authority for the Modern-Hybrid System G, which is a form of the Pharasaic/Hasidic Passover and Unleavened Bread practice, is clearly not derived from Scriptures. Obviously, there needs to be a reawakening to Yahweh’s truth concerning the 7-day Festival of Passover and Unleavened Bread being observed during Abib 14-20 (System A). For a more complete discussion regarding the evidence for the true practice of the Festival of Passover and Unleavened Bread as observed by Yahushua the messiah and his disciples please refer to our Passover Series. This entry was posted on 03/31/2015, 5:14 pm and is filed under C.O. Dodd, Calendar, Feast Days, Herbert Armstrong, Jews, Passover, Religion, Unleavened Bread. You can follow any responses to this entry through RSS 2.0. You can leave a response, or trackback from your own site. Excellent post, and is very thought-provoking!